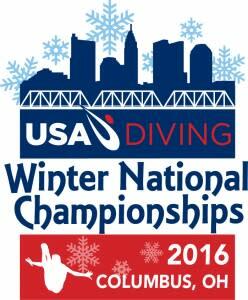 More than 125 of the nation’s top divers, including six Olympians and several divers with ties to Columbus are among more than 125 divers registered to compete at the 2016 USA Diving Winter National Championships, set for December 15-21 at the McCorkle Aquatic Pavilion on the Ohio State University campus. 2016 silver medalist Michael Hixon, an Indiana University junior and son of former Ohio State All-American diver Mandy (Glenner) Hixon, 2016 silver medalists Sam Dorman and Steele Johnson, along with Kassidy Cook, Amy Cozad Magana, Jessica Parratto and other divers will be competing for 12 national titles and the opportunity to represent the U.S. in international competitions. Divers will be competing for national titles as well as the chance to represent the United States in upcoming international competitions. National titles will be awarded for both men and women on 1-meter and 3-meter springboard and 10-meter platform, as well as synchronized 3-meter and synchronized 10-meter. The winter nationals will be used to select the divers who will compete at the 2017 World University Games and at 2017 FINA Grand Prix meets. Additionally, four divers will punch their tickets to the 2017 World Championships, with winter nationals being used to select the 1-meter spots for next summer’s World Championships. *NOTE: Cameron Thatcher and Jack Matthews will compete at the USA Diving winter nationals after representing Team USA the Junior World Championships in Kazan, Russia earlier in December. In addition to Matthews, other current Ohio State Diving Club team members Noah Duperre, Jordan Rzepka and Maycey Vieta plan to compete, as do Ohio State University divers Haley Allen, Christopher Law, Stephen Romanik (Northfield) and Clay White (Pickerington). Through Student Life Rec Sports, the Ohio State Diving Club and the McCorkle Aquatic Pavilion have hosted USA Diving regional, zone and national championships with the last Winter National Championship hosted in 2014. McCorkle will also host the 2017 AT&T USA Diving National Championships July 30-August 13 with approximately 700 of the nation’s best junior and senior divers competing for various national titles.